Steve, Terri, and Bindi. Steve can be seen holding a ferocious looking teddy crocodile. Steve is the best and he is my hero! I remember when i went to Australia when i was younger and we met Bindi at your Zoo, she was so nice and polite, my mom just loved her!!!! Steve was for me, the best man on Earth because his passion and his love for the animals, was only of him. She\'s a beatiful young lady! She looks like Steve, jaja! That\'s the reason she is so pretty! I proud of my girl Terri, she\'s a warrior, Terri and Steve are my heros. I hope you, stand my english because I can\'t speak it so well. I loved Steve Irwin. He was a great man and he loved his job. He was always caring to other people. I feel for you Terri, Bindi and Bob off your lose of Steve. He was a great father and a great husband. I came to your Zoo a long time ago and I meet Steve, Terri, Bindi and Bob you all are such loving people and I really mean it. This picture of Steve, Terri and Bindi is the best picture of I have ever seen and that is the truth. Anybody who reads this will understand where I am coming from just you wait and see. Remember the word that Steve always loved to say !CRIKEY! now that is the best picture and the best word I have ever seen or heard. i'm a huge fan of of all the Irwins and i cryed my self to sleep when they showed his memorial service on tv i couldn't believe it. i was devastated. Bindi is awsome and i have not missed 1 of her Bindi the jungle girl show and i have Bindi kid fitness and i'm getting Bindi the jungle girl and i also have a full folder on all the Irwins and thing that it th paper i cut out and put it in the folder. my mum is burning the 6 volume dvds of steve Irwin for me and i have the movie Collion course. I have been to Australia Zoo and i got my picture tacken with a snake (python) and i shook hands with steve and i also seen Bindi on the back of a postie bike with steve when she was about 14 months. and im going to Queensland next year and im going to visit Australia Zoo again. and i hope to met Bindi, Terri and Bob. i can't wait to visiot Australia Zoo again. I think Bob is so cute and Terri is wickard as. Steve i miss you so much. He loved both his children so much, just when you thought he ran out of love, he gave more. He was his childrens heroes, and they were his. I miss ya Steve! Look forward to catching crocs in heaven with ya someday! Rest In Peace and God bless your family & friends! I MISS YOU STEVE,I LOVE YOU.MY THOUGHTS AND PRAYERS ARE OUT FOR THE FAMILY AND CLOSE FRIENDS.LOVE YA CRIKEY.REST IN PEACE MATE! guys friends Casey Rogg, and Peter Woroncow, and Mark Moser in heaven. I will miss U Steve and your wonderfull feelings for animals. R I P and my thoughts to your fantastic wife Terri. R.I.P. Steve. We will miss you! God needed his angel back. I will miss steve sooo much and every time i see an animal i think about him is wont be the same with out u steve R.I.P.!! �n is csak annyit tok mondani....Well will miss you! Steve you'll be remembered for your "PASSION" and "ENTHUSIASM". 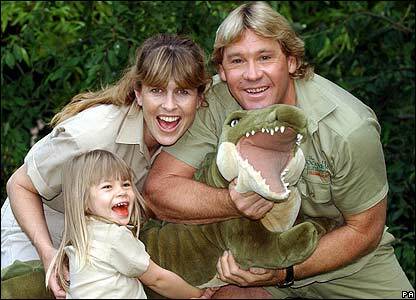 Wildlife Warrior "STEVE IRWIN"..... "YOU WILL BE GREATLY MISSED"
we will miss you steve!!!!!!! This one is great, they are just so joyful, it's wonderful to see ... you have to think that even if for only the time they had, they were lucky.